Have you heard about the national cyclist Dinah Chan getting into an accident? 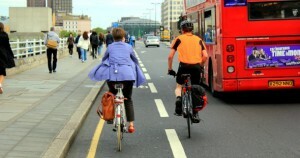 The 25 year old cyclist was doing her cycling training last September when she encountered an accident involving a car. Chan was thankful that there were no broken bones. She is determined to proceed with her training as soon as she is discharged. The Right Position: It is important that you know the right position. If you are a professional cyclist, you will know the proper position. You should make sure to practice it all the time. Exit: If you cannot make it to the track and you feel that you are falling, you should look for the exit. Quickly assess your environment and when you see grassy surface without cars, head to that direction. Soft Landing: When you see the perfect spot for landing, you can let go of the bike now. You should drop the bike as soon as you see the spot. Drop and Roll: There is a right way to drop and roll. When you land, your arms should be bent at the elbows. This is to absorb the initial part of the impact. You should instantaneously roll to your left shoulder and hip. There you go. Hopefully you learn something out of this. Cycling is fun but if you let the news of accidents affect you, you will no longer enjoy the activity. Enjoy the ride and the bump! It will make you stronger and better. Good luck!